I got this idea from a pin on Pinterest, where I get most of my baking ideas lately. The recipe that I found was a little more complicated than I was wanting to deal with, so I simplified it by using a one-bowl chocolate cake. The cupcakes were a hit…some even said they were the best I’ve ever made. Yay! I’ve made them twice in the last two months already. This cake recipe is one of my old stand-bys. I’ve been meaning to post it for ages, but I’m always rushed when I make it, so never take the time to take any photos. This is an updated version of the original that I’ve been baking since I was in college, the original being a recipe from my “Betty Crocker” cookbook, which was my first cookbook. The original recipe just uses chocolate chips, and in a pinch I still do that for ease, thrift and to save time. Also, with the original recipe, you just mix the cake directly in the pan…but I find that its actually easier to mix in a bowl. It’s a great recipe to throw together when you have surprise company coming, or if you suddenly find yourself needing something sweet to eat. I always store excess frosting in the freezer, and use it to top the cake (I’ve used everything from leftover chocolate frosting to leftover orange-cream cheese frosting), or if it’s just a last minute thing that I’ve thrown together, I leave it in the pan and top with powdered sugar. Both ways are delicious. Lastly, the reason I put this recipe in the vegan category is because of the cake…it’s completely vegan (just make sure you’re using vegan chocolate-very easy to find! ), and is really great just topped with powdered sugar as a vegan treat. 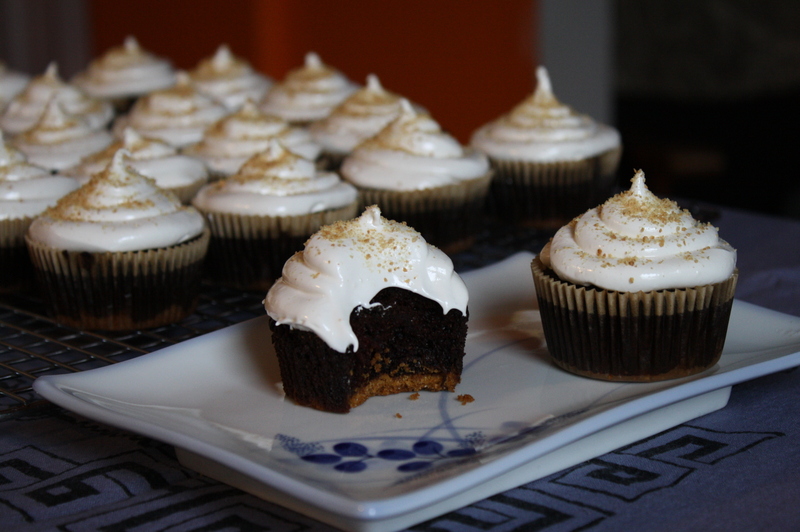 Another way I’ve made it for vegan friends also is by baking it into cupcakes (without the graham cracker crust it makes about 12 cupcakes), and frosting with vegan whipped cream. Preheat oven to 350 degrees F. Melt butter, and stir in with graham cracker crumbs and sugar in a small bowl. Line 20 muffin cups with paper liners, and place 1 tablespoon of graham cracker mixture in each cup, pressing down with a small flat-bottomed cup. Bake for about 5 minutes, until base hardens. Set aside and make cake batter. Mix together dry ingredients in a large bowl. Add water, oil and vanilla, and whisk until incorporated completely. Add chocolate and stir until just incorporated. Fill prepared cupcake papers 3/4 full with batter. Should stretch to make about 20 cupcakes. Bake for about 18-20 minutes, until toothpick inserted comes out clean of cake batter (it may have a little melted chocolate on it, and that’s ok). Allow to cool for 10 minutes on cooling rack, and then remove the cupcakes from the pan and cool completely. Place egg whites, sugar and salt in the bowl of a stand mixer and set over medium saucepan of barely simmering water (you can put it in a double boiler, but then you have to transfer it to a mixer bowl, and this way is much easier). Stir the mixture with a whisk, cooking until the sugar has completely melted, about 5-10 minutes. Transfer to the mixer fitted with a whisk attachment. Mix on medium-high speed, adding the vanilla while mixing, for about 7 minutes. To pipe the frosting: Place pastry bag with tip cut off (or ziplock bag with one corner cut off) in a large glass and fold the sides of the pastry bag over the sides of the glass (if you shop at Trader Joe’s and use their coffee, I’ve found that their coffee containers work perfectly for this!). Fill bag with frosting and pipe onto cupcakes. If you have a kitchen torch, AWESOME! Use it to “toast the marshmallow.” Otherwise, you can do what I did and just sprinkle some extra graham cracker crumbs on top. Voila! S’mores! *Note about cake: to make a plain chocolate snack cake, prepare an 8×8 square pan or a 9″ round pan by spraying with baking spray with flour, pour batter into pan and bake at 350 for 35-40 minutes. You can either leave it in the pan and allow to cool completely, then just serve from the pan, or you can cool on rack in pan for 10 minutes, then invert it onto the rack and allow to cool completely. Sprinkle with powdered sugar for a simple weeknight dessert, or frost with about a cup of whatever frosting you’d like. **Note about egg whites: I’m always looking for things to do with my egg yolks, and vice-versa. You can store yolks in the fridge for up to two days, covered with water. You can store whites in the fridge for up to 4 days, or freeze them for a year! Anyway, here’s an idea for your yolks: meyer lemon bars...I made them, and they’re fantastic! !